Rule Book, 250+ pages, PDF with Digital Map Pack! 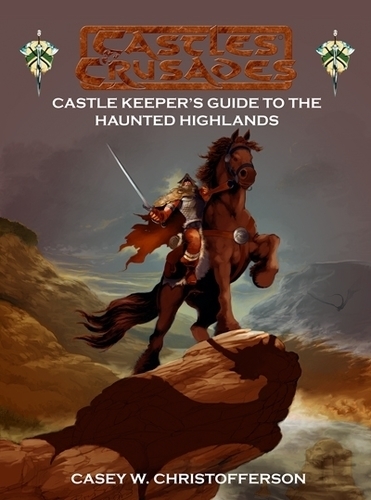 The Castle Keepers Guide to the Haunted Highlands includes everything you need to run a game in the Haunted Highlands and more. Within you'll find the regional history, significant terrain features, regional powers and governments, a pantheon of deities, new monsters and new treasures. It also includes nine complete adventures to be played separately or as a long campaign arc. Upon the bloody northern marches amidst the Haunted Highlands, lies a curious Roadhouse. Here are gathered the flotsam of the world: miscreants, mercenaries, soldiers of fortune, adventurers. Dirty Bowbe's Roadhouse they call it, and it's as rough and safe a sanctuary as any will find in those dark and bloody grounds! Once, long ago, a Kingdom thrived here and the wealth of its coffers flowed across the lands as honey from a jar. From the deep, blue waters of Lake Veyona to the broken crags that overlook the Northern Steppes the King ruled a realm, both prosperous and contented. But all things must end. And the wages of war and plague overwhelmed the King and his people and ground all to ruin. And the days of the Highland Kingdom are long past so that now nothing but memories remain . . . haunting those who dwell in the aftermath. Or so such tales are spun by the hearth fire at Dirty Bowbe's Roadhouse to any and all who pass through, for that legendary tavern lies at the center of the world.